“It would not be unusual to hear one of our colleagues say I am justa bus driver, I’m justa secretary or I’m justa custodian,” the recently retired MEA Northern Zone Director told attendees at the ESP Statewide Conference in Port Huron last week. Williams began her career as a substitute bus aide, and she worked as a special education paraprofessional before earning a degree and credential to become a special education teacher. Her involvement in union leadership eventually led to professional and management roles at MEA. Her point was reinforced by another messenger—Gov. Gretchen Whitmer, who said she traveled to Port Huron for the conference because she understands the importance of school support staff. 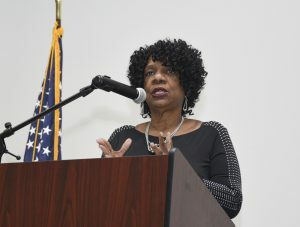 She urged conference-goers to contact their state representatives and senators – both Republicans and Democrats – in support of her budget plan. Whitmer’s proposal would restore $507 million in education funds by raising the gas tax to pay for road repairs. Over the past several years, the School Aid Fund has been raided to pay for other priorities, such as roads. Whitmer told the audience that increased revenue and additional spending in her plan are connected, so you can’t be in favor of investing in education without backing a plan to pay for it. Members and leaders from all over the state attended the two-day conference to take advantage of professional development on topics ranging from leadership principles to grievance processing, CPR and first aid, MEA and NEA member benefits, and understanding laws related to school work. Donna Stark is a secretary and local president in Holland who says she always learns from attending the statewide conference dedicated solely to issues faced by support staff. Stark represents school employees working in custodial, food service, maintenance, office and transportation. Library media technician Jake Reno was attending his first ESP conference after going to other meetings and trainings put on by MEA in his five years working at schools in St. Clair Shores. As treasurer and membership chair of his local, he hoped to pick up organizing and bargaining tips. Reno said he personally speaks with new hires and asks them why they wanted the job, and he often hears the same answer. It’s one he can relate to, and that makes it easy to talk about why joining the MEA is important.